If you are following me on Instagram, then you would have known my recent addiction towards beans and legumes. No big reason behind the obsession. 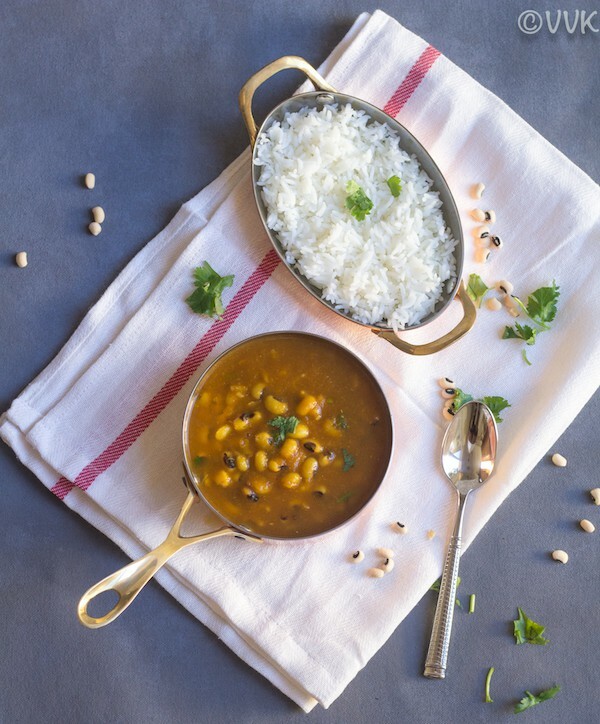 We want to improve our protein intake and being a vegetarian, lentils, and legumes are our primary sources. :-) I recently tried pulav with sprouted horsegram and coconut milk based curry with kidney beans. 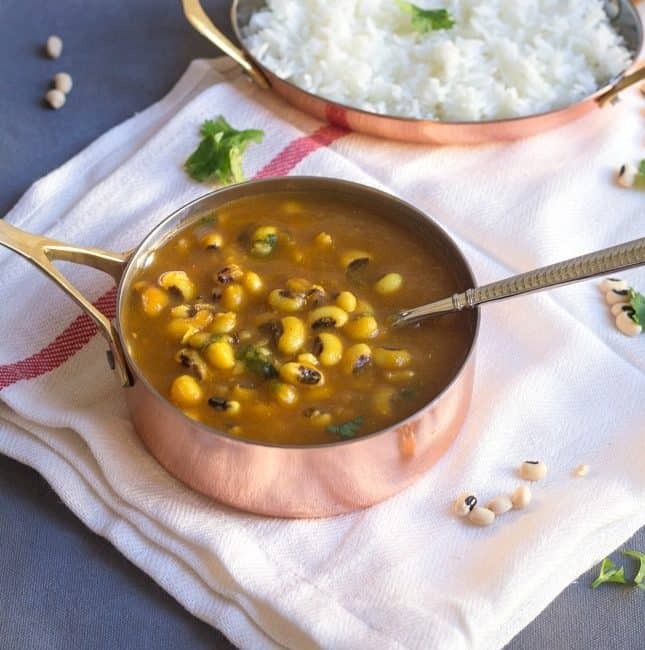 I know I need to post them all here, but before that, I thought I would share this easy curry recipe with cowpeas. 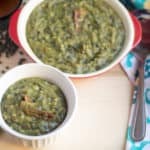 My love for cowpeas is not a secret. 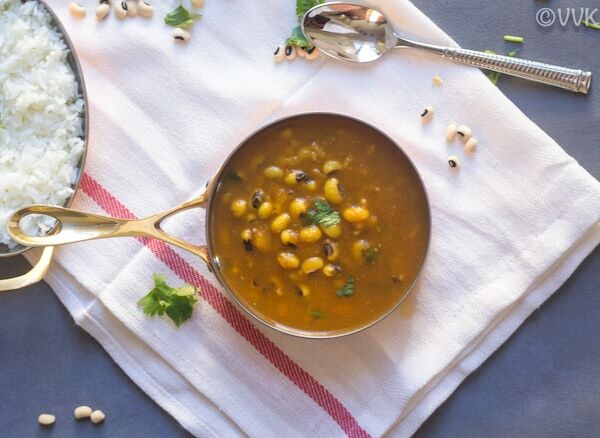 I have already posted two black-eyed peas curry recipes. (Gujarati and Konkani version). 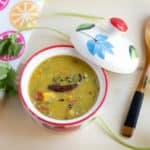 Now here is another curry recipe without any oil. According to SF Gate, Dried black-eyed peas are rich in fiber, protein, folate, iron, potassium, thiamin, manganese, magnesium, zinc and copper. They’re also a good source of selenium and vitamins B2, B5 and B6, and provide useful amounts of vitamin K and calcium. I have mentioned multiple times here that I usually cook in the evening and have it for dinner and pack the same for next day lunch. So I always look for recipes that pair well with both rice and roti. And this curry is one such recipe. We relish this with roti for the dinner, and I pack this with rice for our lunch. For this recipe, I soaked the beans for only 20 minutes but cooked it for eight minutes in high-pressure mode and released the pressure naturally. If you have soaked the beans, then go for eight minutes in low-pressure or five minutes in high-pressure mode and release the pressure quickly after three or four minutes. We prefer soft, tender and non-mushy beans these days and this timing works out for us. But depending upon your texture and crunchiness preference, you can adjust the time. 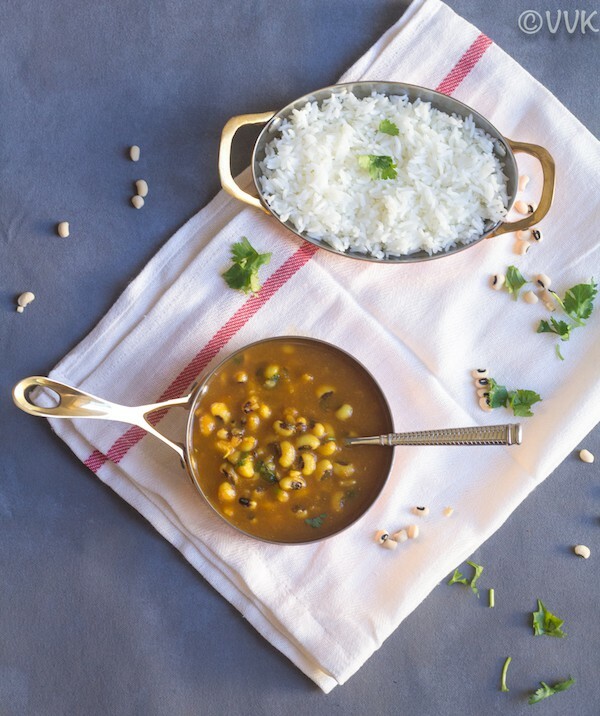 Instead of cowpeas, you can prepare this curry with pinto beans, red kidney beans or with your favorite bean. Instead of coriander powder, cumin powder and red chili powder you can add garam masala or the curry powder mix. This is a basic recipe and I went with our preferred spice combination. Without any further ado, here is the video and the detailed recipe. If you haven’t subscribed to my channel, please do subscribe and share your thoughts and feedback. Trim the edges of the tomatoes and cut them into halves. Also, peel the garlic skin and chop the green chilies. Wash and soak the black-eyed peas for 20 minutes. Add the chopped onion, garlic, green chili, ginger and tomatoes to the instant pot. Then add 2 cups of water. Now press the manual or pressure cook button and cook this on high pressure for 5 minutes and then release the pressure naturally. When the pressure is released, press the cancel button and carefully open the lid. Allow the mix to cool down for 5 to 10 minutes. Drain and reserve the water. Remove the tomato skin and grind the cooked onion, tomato, garlic, green chili and ginger into a fine puree. Now place the inside pot back in the IP and pressure saute button. When it is hot, add the puree. You can use some of the reserved stock water and rinse the mixer jar and add it to the puree. Now add all the spices – salt, red chili powder, turmeric powder, coriander powder, carom seeds, cumin powder. Mix it thoroughly and then add the black-eyed peas. Mix it and add the remaining of the reserved stock water. Press the cancel button and close the IP lid. Make sure the vent is in the sealed position. Pressure cook this for eight minutes in high pressure and release the pressure naturally. Mash some of the dal with the back of the spoon. This helps in thicker consistency gravy. Finally, add in the jaggery and cilantro. Mix it, and that’s it. 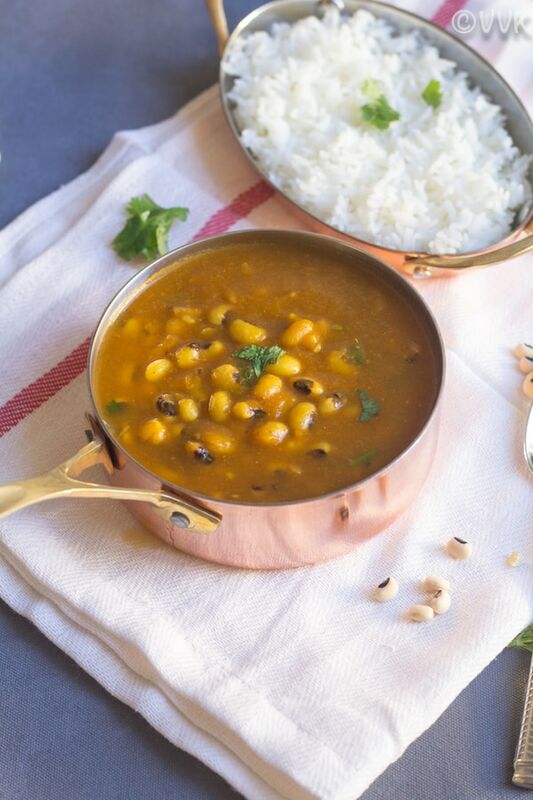 Cowpeas curry is now ready. Carom seeds are optional. As I did not include hing, I went with carom seeds. 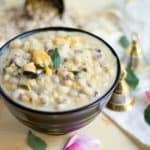 You can use ground carom seeds also. 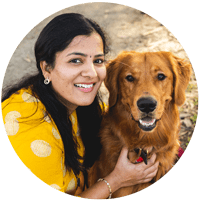 Jaggery is optional, and if you can’t find it, you can use raw sugar or cane sugar. The cooking time varies depending upon the quality of the bean and also if it’s soaked or un-soaked. Please check the post for more details. You can make this recipe in the pressure cooker as well. You can cook the tomatoes and onion for two whistles and make the puree. You can then follow the steps as mentioned above and then after adding the beans, you can cook for four to five whistles depending upon the soaking time. 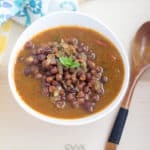 No Oil easy peasy lip-smacking black-eyed peas curry prepared in the Instant Pot. A perfect meal for the weekdays. Now add all the spices - salt, red chili powder, turmeric powder, coriander powder, carom seeds, cumin powder. Finally, add in the jaggery and cilantro. Mix it, and that's it. Cowpeas curry is now ready. Jaggery is optional as well, and if you can't find it, you can use raw sugar or cane sugar. The cooking time varies depending upon the quality of the bean and also if it's soaked or un-soaked. Please check the post for more details. 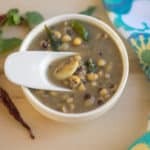 You can make this recipe in pressure cooker as well. You can cook the tomatoes and onion for two whistles and make the puree. You can then follow the steps as mentioned above and then after adding the beans, you can cook for four to five whistles depending upon the soaking time.